What student pilot is not intensely interested to know what to expect on the upcoming checkride? And what could be more interesting than learning something about the person who will evaluate your flying? You've heard that most applicants take their flight tests with an FAA designated pilot examiner (DPE). This is an experienced pilot who applied to the FAA for examining authority, met stringent qualifications, received training, and was assigned based on testing needs in your area. Joel Stoller's article, "A designated challenge," on the AOPA Flight Training Web site describes how DPEs earn their spurs. Also, check out the FAA's Web page that sets forth examiner qualifications and authorizations. Usually your DPE won't be a totally mysterious figure. That's because your flight instructor has probably sent other applicants to him or her for testing. Your CFI can set your mind at ease about flying with this authority figure—most are easygoing "regular pilots" who want test-takers to be comfortable. You may even become acquainted with your DPE before test day comes. Many are affiliated with a local flight school or other aviation business. They may be open to discussing checkrides with you in general terms and willing to describe both the good and bad traits they have observed in recent test-takers, as demonstrated in the February 2000 AOPA Flight Training feature "The examiner's lament." How much will the checkride cost? This question came up recently in the AOPA Aviation Forum. Prices vary, as forum readers reported. There is no set fee schedule, so research the question locally and budget accordingly. Suppose you find out late in the game that your examiner will be unavailable on test day, and you will have to fly with another DPE? No worries! If your training followed the official rulebook for your checkride—that is, the practical test standards (PTS) for your private, recreational, or sport pilot certificate—it won't matter who conducts your flight test. Meet the PTS requirements, and a DPE will soon be endorsing your logbook for a successful checkride. Now that spring is here, beautiful, sunny days aren't far behind. Unfortunately, those coveted warm days with calm winds can create annoying turbulence as bubbles of heated air begin rising, creating thermals. Early in the morning before the sun heats the ground, or late in the afternoon as it's cooling off, the air will be smoother. If you have basic knowledge of what causes turbulence, you can avoid it. Find out more on AOPA Online. Do you have a question? Call the experienced pilots in AOPA's Pilot Information Center at 800/USA-AOPA. They're available to take your calls weekdays 8:30 a.m. to 6 p.m. Eastern. As an AOPA Flight Training Member, you have access to all of the features within AOPA Online and AOPA Flight Training Online. Login information is available online. A flight school in Lantana, Fla., has closed its doors following a March 13 accident in which one of the school's owners died. Jeffrey Rozelle, co-owner of Kemper Aviation, and three others died when the Cessna 172 in which they were flying struck the ground in a cow pasture and came to rest inverted. Co-owner Arkshay Mohan said the school ceased operation on that day, according to a report in the South Florida Sun-Sentinel . The National Transportation Safety Board issued a preliminary accident report stating that an eyewitness saw the airplane make several low passes over a pasture before the aircraft's nose dropped and tail went "straight up." Any type of flight performed close to the ground can be considered maneuvering flight, and nearly 27 percent of all fatal accidents that occurred in the past 10 years involved maneuvering flight. To learn more, download the AOPA Air Safety Foundation's Maneuvering Flight: Hazardous to Your Health? Safety Advisor. A federal grant of more than $800,000 will help Delaware Technical and Community College start a new aviation maintenance program. The U.S. Labor Department awarded the grant to set up the program in cooperation with Delaware businesses. The program will be located at the Georgetown campus with airframe maintenance training to begin in the fall. Plans are to expand to powerplant and avionics maintenance with the addition of evening classes. College officials project 70 students will join the program, according to a report in the Delaware News-Journal . The owner of a California agricultural services company has donated his restored 1962 Grumman G-164 Ag-Cat to the Smithsonian's National Air and Space Museum. Ralph Holsclaw, president and owner of Growers Air Service in Woodland, said his company once operated six airplanes with six pilots, flying 4,500 to 5,000 hours of crop-dusting operations per year. He says the company now flies about 3,000 hours per year operating three aircraft. The agricultural application industry has gradually moved to larger turbine aircraft that go faster and carry more payload. The Grumman Ag-Cat will be on display at the Smithsonian's Udvar-Hazy Center in Virginia this fall, according to an article in the Woodland Daily Democrat. With aviation safety stories making headlines nearly every week, you need an experienced source to help you make sense of it all. Bruce Landsberg, executive director of the AOPA Air Safety Foundation, has launched a new Safety e-Journal . He'll discuss safety-of-flight issues, procedures, techniques, and judgment. In the spirit of Web logs, you'll be asked for your input on these important subjects, so be sure to check it out! Looking for some extra cash to finance your flight training? If you sign up for AOPA Project Pilot at Sun 'n Fun between Tuesday, April 8, and Friday, April 11, you'll receive a sticker to wear that will make you eligible to win a scholarship. If the AOPA SurPRIZE squad spots you wearing the special sticker, you could be one of eight who receive a $250 scholarship. Of those eight, one will win $3,500 for flight training on Friday, AOPA Day. Also, if you sign up for Project Pilot with a mentor at the Sun 'n Fun entrance gate Tuesday through Friday, you'll get a free one-day pass. With all this talk about engines, paint, interior, and avionics, it might be hard to believe that there's a lot of underlying work that goes into AOPA's 2008 Get Your Glass Sweepstakes Piper Archer. Parts like wheels and brakes are important for flight safety, even if they aren't as glamorous as high-tech boxes. After all, they're the first things you check when you roll out of the parking spot, right? See AOPA Online for an in-depth look at everything we've done to improve the Archer's airframe. Before you start shopping for an aircraft, talk to an aviation specialist broker. An experienced broker will be able to advise you what various underwriters will require for minimum pilot qualifications, provide you with common checkout requirements, and give you an estimate of annual insurance costs for various types of aircraft. While you may have the monetary resources to move from a Skyhawk to a Baron 58, without the proper ratings, flight time, and training, you may find that insurance is cost-prohibitive or even impossible to obtain. The time to find this out is now, not after you've entered into a sales agreement. Read more on AOPA Online. A checklist can get torn, oil-stained, or dingy just with regular use. Laminating it is great, but then you can't note anything on it. Flyboys Checkbook Pages might be your answer. These heavy-duty plastic sleeves come in a variety of sizes. You can use them to store checklists, frequently used approach plates, or even sectional charts. Prices range from 52 cents for an 8-inch by 5-inch sleeve to 71 cents for the 5-inch by 11-inch sleeve. Bulk packs of 25 sleeves are available, ranging in price from $12.50 to $17.50. Order the Checkbook Pages online from Aircraft Spruce & Specialty. Question: What could it mean if I'm getting an indication of excessively high oil pressure? Answer: An indication of high oil pressure is unusual. This could be caused by an obstruction in the oil line, a faulty regulator valve, very cold oil, a faulty gauge, or even an electrical problem. Although the situation is not necessarily an emergency, be aware there is a potential circulation problem and expect the oil temperature to rise. Remain vigilant and proceed to the nearest airport. Read more about solving engine problems in this AOPA Flight Training article and the AOPA Air Safety Foundation Engine Operations Safety Advisor. Also take the Engine and Propeller online course. Looking for some really fabulous aviation photography? All the air-to-air photos and beautifully detailed ground images used by AOPA Pilot magazine over the years are yours at the click of a mouse button. Download your favorite images to use for wallpaper, send an e-postcard, or order prints online. For more details, see AOPA Online. Getting ready for the cross-country portion of your flight training? Use AOPA's Airport Directory Online to help you plan your flight. Once you enter your destination airport in the directory, you can print airport and taxi diagrams in kneeboard format and check FBO fuel prices to see which one offers the best deal. West Des Moines, Iowa. The 2008 Severe Storms and Doppler Radar Conference takes place March 20 through 22 at the West Des Moines Sheraton. Contact Rodney Donavon, 515/270-4501, or visit the Web Site. Nashua, N.H. The 2008 New England Aviation Safety Expo takes place March 29 at the Eaton-Richmond Center at Daniel Webster College. For more information, contact Karen Goff, 603/879-6807, or visit the Web site. Macon, Ga. The Cherry Blossom Balloonfest and Airshow takes place March 29 at Macon Downtown (MAC). For more information, call 478/751-7414, or visit the Web site. Various locations, Kan. The All Kansas Air Tour, a seven-day trek across Kansas, takes place April 1 through 8. For more information, contact Ed Young, 785/296-2553, or visit the Web site. To submit an event to the calendar or to search all events visit AOPA Online. 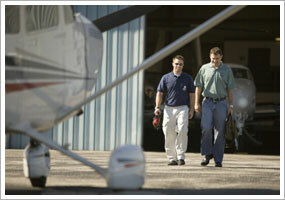 For airport details, including FBO fuel prices, see AOPA's Airport Directory Online. The next AOPA Air Safety Foundation Flight Instructor Refresher Clinics are scheduled in Reston, Va., April 5 and 6; and Denver, Atlanta, and Salt Lake City, April 12 and 13. For a complete schedule, see AOPA Online. Can't make it in person? Sign up for the CFI Refresher Online. AOPA Air Safety Foundation Safety Seminars are scheduled in Rosemont, Ill., and Morristown, N.J., March 31; Newton, Mass., April 1; East Windsor, Conn., and Gaithersburg, Md., April 2; Manchester, N.H., April 3; and Lakeland, Fla., April 12. The topic is "Top 5 Mistakes Pilots Make." There are also Safety Seminars scheduled in Lakeland, Fla., April 10 and 11. The topic is "Thunderstorms & ATC." For details and a complete schedule, see AOPA Online.